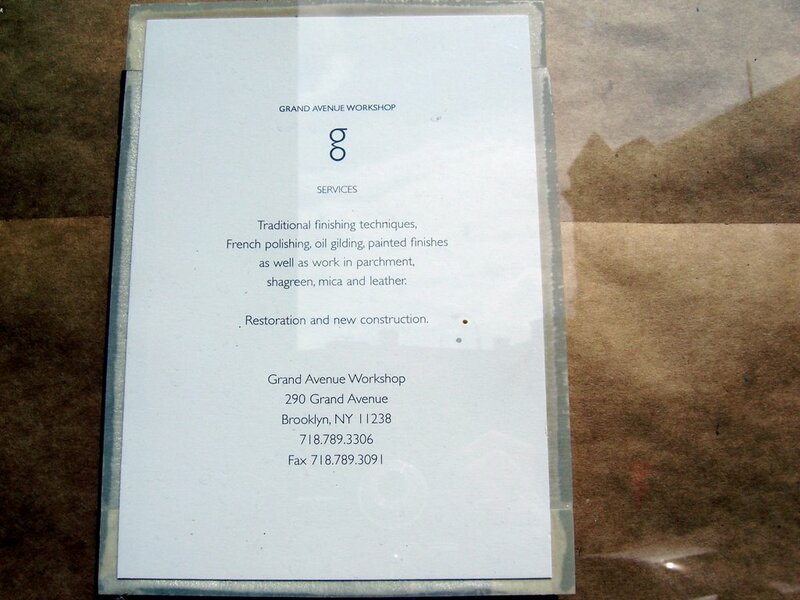 A reader tipped me off to some new stuff going in on Grand, just south of Lafayette. Of course, I checked it out (after a stop for an iced coffee and scone at the beloved Choice Market!). 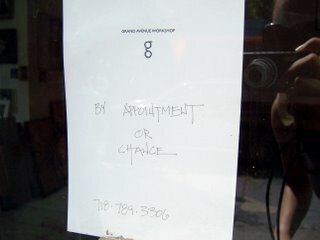 I've been looking at the intriguing storefront across from the late Karrot for awhile now. Finally, there's some signs in the window! I wasn't lucky enough to find someone inside, so I gave them a call. After 24 hours of phone tag, I connected with Carl, the owner. Grand Avenue Workshop does restoration and finishing on antiques and newer pieces. His clients consist mostly of architects and designers/decorators. Neighbors are often dismyed to find that he doesn't work on weekends when they might be around to stop in. However, he doesn't do much work for local area residents -- that is, unless they've hired an architect to renovate for them. He works when the professionals work, and describes his business as "a strange hybrid that only resides in NYC." Carl has been in business for twenty years, and has lived in the neighborhood for that long, too -- he's a "Pratt Kid who never left." His shop on Grand Ave has been there for the last five years. He says that lots of people will pop in on their way home from work if they see him in the office to find out what exactly he does. He seemed pretty jovial about that, but warns, "I am NOT the neighborhood fix-it man! I will not hang your cupboards for you!" I'm a bit of a grammar hound, and stuff like this sends me into a tailspin. Do they mean "mirrors," plural? 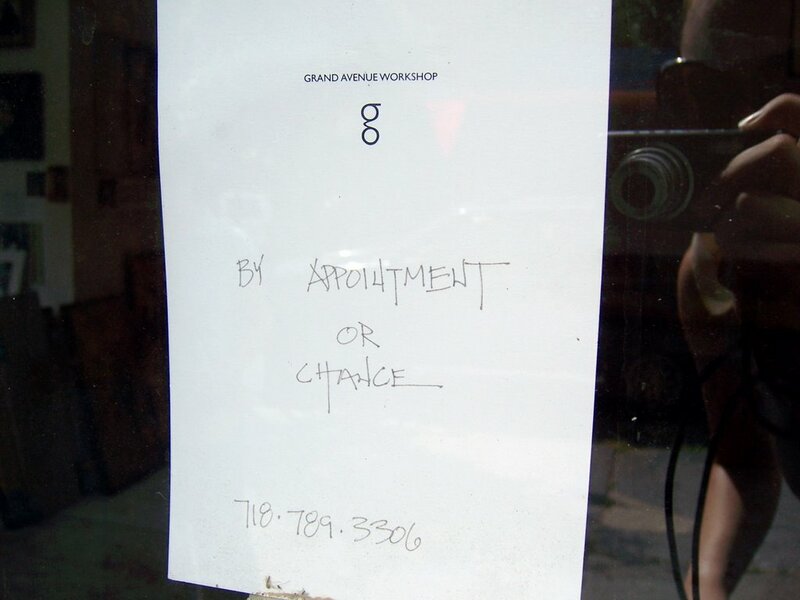 Or the name of the store is "Mirror," and the store belongs to it? PLURAL WORDS DO NOT GET AN APOSTROPHE. Still confused? Check out the Apostrophe Protection Society.